Just got back from a quick trip to WI. I got to go this time with my son Justin. We had so much fun together. I convinced him to go light painting with me. Light painting is a technique that I am learning to do. It is basically fun with a very large flashlight. We went around looking for fun things to light up. 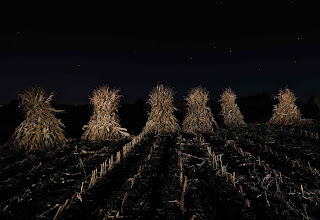 We found these corn stalks that the Amish had put up. So off to the field we went. I will try to go into more details about the shot later - I am really tired and ready for bed - but wanted to get this up. Justin - I am so glad we had this time together. Love ya!